Squareball: don't apply if you're a gaming wuss. Every now and again, a game comes along that makes you feel like a ham-fisted idiot, as though you’re clawing at your iPhone or iPod touchscreen with all the grace of a lobotomised monkey wearing boxing gloves. But the game is so compelling and addictive, you play on anyway, getting killed approximately every ten seconds, going ARRRGGGHH and then having another go anyway. Eventually, you realise that it’s you, not the game. The game isn’t unfair—you’re just rubbish, and you need to learn how to improve, just like in the old days with the likes of Defender. 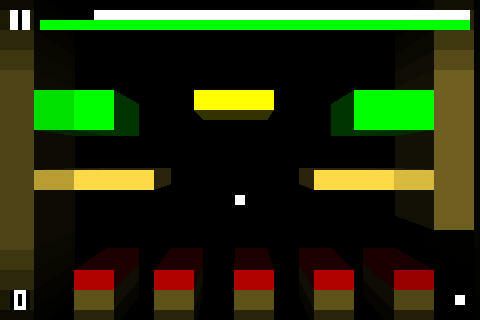 Squareball by Finn Ericson ($1.99/£1.19, App Store link) is one such game. The concept is simple: drag the levels left or right to ensure your ever-bouncing ball doesn’t disappear into a hole or hit red tiles, and collect all the green tiles before the timer runs out. With graphics akin to Atari’s Adventure in pseudo-3D and a fab soundtrack, this game’s had me addicted and loving it and hating it in equal measure since its day of release. Today, I interviewed its creator to find out how this retro-themed mix of Pong, Breakout and simplified Super Mario-style platformer came to be. Cult of Mac: Why did you decide to create a game for iPod? Finn: I had been struggling with game development for the extremely fragmented mobile market. As soon as I heard that Apple would allow third-party apps on the iPod I realised that would be the way to go. The installed base is large enough with almost zero fragmentation. Also, I really like having to think differently about games—virtual gamepads make me nauseous. How would you describe Squareball? Save for Space Invaders I think Squareball is the only game for the iPod that really feels like a true action videogame. The controls are real-time and virtually lag-free, and there are no loading times. 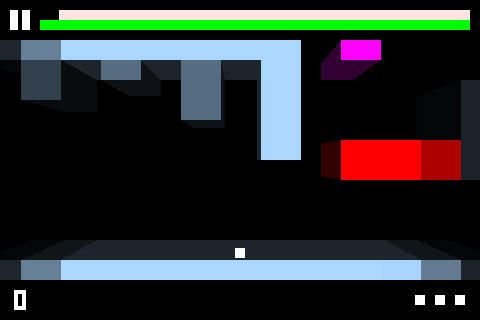 The object of the game is to bounce a ball through a tunnel, collecting stuff and avoiding obstacles. The game is controlled by moving the tunnel the same way lists are navigated in utility apps. Avoid the red, or you're dead. What was the genesis of Squareball? Where did your ideas and inspiration come from? Well, the idea came from an old homebrew DOS game called Starball. My associate at Crappy Game tipped me off on this idea, and I realised how well it would work with swipe controls. What was the thinking behind Squareball’s decidedly retro graphics? 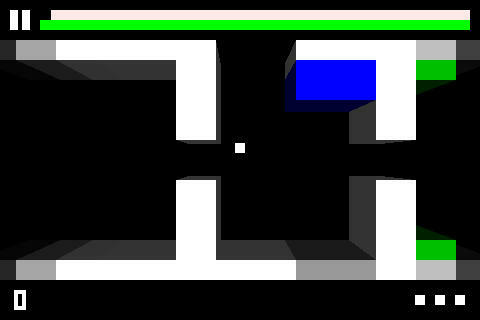 I prototyped the game using just solid color blocks. People that tried the game really liked the look, so we went with it. I think we might add a modern skin to it later—think R-Type Delta—and let the player decide what kind of look they want. Squareball is brutally difficult, matching its old-school graphics with old-school gameplay. Why did you make it so tough? Both me and my associate at Crappy Game are inveterate old-school gamers. It might be hard to believe, but we spent a lot of time making the stages easier. There are a few passages that didn’t turn out as well as we’d like and they will be tweaked in the next version. Still, people can’t stop playing Squareball because they constantly feel like they could do better at it. This will be further strengthened soon with online hi-scores and achievements. Some levels scroll vertically. They're not any easier, though. What’s the feedback been like regarding the game? What’s coming up in the next version? Feedback has been unbelievable. App Store reviews throughout the world are 95% five-star. Unfortunately, press coverage has been meagre, although very positive. Also we stupidly had the lite version rejected due to up-selling, but a revised version will be out any day now. Hopefully, more people will then dare to try the game. The next version will be a minor update featuring tweaked stages, different ball speeds, achievements, quick stage restart, 2.2.1 support and bug fixes. I am currently working on the sequel to my first iPod game Diorama. Diorama 2 will take advantage of features of the iPhone 3GS and the new iPods to further enhance the holographic effect. Also the structure of the game will be very different. I wont spoil anything at this stage but will keep you posted. After that I’ll do peer-to-peer! You can find out more about Squareball at dromsynt.com/squareball/ and buy it from the App Store for $1.99/£1.19.